I honestly have no idea what that means so if anyone has any ideas or knows something I don't let me know in the comments. Thanks monochromatic for leaving a comment regarding this, appreciate it. 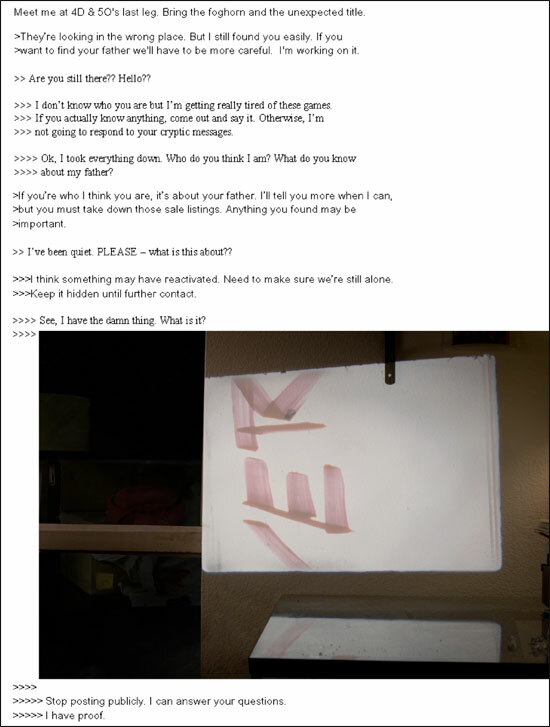 Well 4d and 50’s last leg is most likely where this print out conversation is taking place, but it states that “they’re” looking in the wrong place. Could “they” be us? And if so, where else could we look? I have a feeling that this could mean a new viral sight of some sort, or a secret on rocket poppeteers.com. Just my guess. Just curious, what makes you think that’s the address? I was thinking the same thing but look at the map, there is a lake there… Maybe they are to meet there and the foghorn is like the “I’m over here” thing. And he says bring the unexpected title… Scariest thing I ever Saw. That’s not in Weirton. It’s about an hour and a half away in Morgantown. What do you know about the filming, other than some of the filming takes place in Weirton WV? Is it impossible to think that some of it might be filmed slightly outside of Weirton. And that is the address that comes up on Google Maps. It’s only about hour and a half away from Weirton, so I don’t see why it can’t be there. Don’t act like you know everything about this film and it’s viral, ’cause we don’t know everything yet, we’ll just have to wait and see. *is it impossible […] outside of Weirton? 26062 basically said it already, but all I was pointing out was that the viral would pertain to the actual plot of the movie and not the shooting locations which are in and around Weirton. The actual movie itself takes place in Ohio, not West Virginia… Plus, if we’re really going to argue about this, it’s not 50 (fifty) it’s 5O as in the letter, so it doesn’t make sense anyways. And my first comment responding to your post above was just asking you how you came up with it, I didn’t mean any disrespect… calm down. Don’t know about the rest of it, but last leg sounds like a race or a trip to me. That might explain the foghorn. It could be used as a way to recognize a person in a large group of spectators. Also the letter and number combos could be part of grid. So maybe it is a small local map with a grid detailing the route of a trip or race? That’s a good point about the grid, 4-D / 50 – S maybe? I agree…check out the ohio state map. There is a train route that somewhat follows these coordinates ( 4-D, 5-O). I talked about the Super 8/Fringe/ Wickham connection (shape-shifters and parallel universes) on the forum. On Fringe the main plot revolves around a parallel universe. When I saw 4D, i immediately thought of the fourth dimension. So I went to wiki and typed in 4D. Of particular interest might be: fourth dimension, 4-D (The X-Files), and 4-D film. Any thoughts? Also from wiki: Final approach (aviation), the last leg in an aircraft’s approach to landing. Charles H. Townes builds the Maser in 1953 at the Columbia University. The Soviet Union launches Sputnik 1, the first artificial satellite to orbit the earth on October 4, 1957. The United States conducts its first hydrogen bomb explosion test. The invention of the Transistor. The invention of the Solar cell. I LOVE WIKI! Check this out about “foghorn” on wiki: “The Fog Horn” is a 1951 science fiction short story by Ray Bradbury. You have to read the plot summary! In addition to the plot summary, read the background too. Note the title changes. OK, can any put these pieces together??? Some more things from wiki (unexpected title) could refer to : Title Unexpected | Series: Heroes | Season 1 | Episode 16 |, The Unexpected (Animorphs) , and Tales of the Unexpected. Ummmmmm… Two fonts are used, one is a serif, Times New Roman, and the other is a sans serif. The sans serif looks like Veranda, but the lower case “o” is not Veranda. It is diamond-shaped and looks like OCR-A, an early computer font. anyone try putting this into .reenter? |Plus, the foghorn and the unexpected title could be old possessions of evelyn’s. Btw, can somebody get back to me about the sties/#ari85? Im curious to know if that leads to something. Has any one read this from the bottom up it makes more sense. Yea, I just noticed that myself. It makes a lot more sense. But, I figured maybe it was being spit out on a DOS type screen, which would make the bottom entry the first one. 4D: possibly 40; room 40 was the British government’s military decoding center in WWII. D in latin is 500; could 4D be 4 X 500 = 2,000; or 2000, or 20:00 = 8:00 p.m. I wonder why it’s called scariest thing I ever saw… any ideas? Ok, what in the world is a hoghorn? Theory: Maybe he meant “Foghorn” as the book/short story and “unexpected title” as in something the whole world didn’t expect, like the alien footage, maybe to compare or contrast? I think it means the foghorn in Weirton, perhaps a bell which the people of Weirton call “the foghorn” and when you ring it, it means there is something wrong and you should evacuate the city. Well, it doesn’t have to be Weirton. Where ever the movie takes place, there could be a foghorn. I’m gonna say that IMHO, “The Foghorn” likely refers to the Book/Story by Ray Bradbury, because an actual lighthouse with foghorn and all would be extremely difficult to bring without alerting anyone. The unexpected title could refer to anything. But it most likely has nothing to do with title changes or the title of the movie, probably an Unexpected Book/Movie/Essay/Piece of evidence or something. I like knowing that it reads bottom up, it helps the conversation make more sense. FINALLY: it is very obviously 4d and 5(oh) not 5zero. Awesome new development with this. Does anyone remember a scene from Close Encounters where the French translator had discovered that a series of numbers he was looking at were longitude/latitude directions? Well could the 4D 50 be something similar to that? I know nothing about chartography, but could this be possible? The Fog Horn/The Beast From 20,000 Fathoms reference…could this be the Celocanth, perhaps? Asking this because the monster from that movie was from the sea. Is the message poster asking for Josh Minker to bring the fish with him? Well.. I am probably wrong but.. I am still under the belief that they “Mysterio and Josh” are going to meet on water somewhere.. A nautical map maybe of a lake or port of some kind. Last leg of a particular run or waterway. Bringing the foghorn to communicate location in the blow the foghorn when you get here sense.. Title..”scariest thing i ever saw”….umm maybe still unsure. Could it relate to the train crash in the trailer?? I matched up the “0” with other o’s in the print out and i would have to say that it is “five zero”. No, its “five, oh” 5O, not 50.
all the other capital O’s are different throughout the whole print out. Was retracing my steps through the hooklineandminker.com site and found this possibly interesting description for the Toadfish on the photo slider. i am drawing a picture of a toadfish right now. Just a hunch but does anyone have a road atlas of of the US? be curious to see whats on page 50 4-D. Maybe one of Ohio. Please stop posting your YouTube link in every post and on the forum. From here on out I’m going to delete the links if it continues. Honestly, there is no alien in the trailer at all, sorry to disappoint. The trailer has been picked through meticulously and there is nothing there. what numbers in the trailer??? Like when they show the wreckage were’nt there numbers on a pole or something, I realized this is probably utterly wrong this morning though. Ok so this is what happened. Josh dad sent him the book marinkg the page with the word trogl . Leaving words highlighted that will possibly lead Josh to a new clue to finding his dad or to things his dad knew or have . The id with the word trogl will most likely be the one of Josh dad and it was indented for Josh to know and find .Its funny cause Josh knows someythings and mr mesterio knows the other half and together they can find what they’re looking for. But this is just the way I see it . toadfish112 is the password for the chat icon on STIES, this is from foghorn and unexpected title. When you back the map out just a bit, there is a Titus Field just to the east of the coordinates. Titus Welliver played the original MIB (Smokie) in Lost. “Titusfield”??? I’ve been away from the STIES and Super 8 universe for a while, but I was just getting caught up today and saw the 4D and 50 leg reference. This sounds like a railway reference to me. There’s been a lot of speculation since the trailer came out about the location of the accident seen therein. I think “4D and 50’s last leg” may reference a branch of a rail line where these two agreed to meet – perhaps in anticipation of the train’s arrival? Perhaps the decision was made during that meeting to derail the train by ramming it? Just speculating at this point, but I really think that, based on J.J. and Spielberg’s acknowledged mutual love of trains, the rail world plays an integral part in the story. Think about it – in the 70s there were a million ways they could have covertly transported something from Area 51 to Ohio without risking a calamity. Why a train? Often times something that specific pops up in a story because it has relevence to how the story will unfold. Just my two cents… Summer 2011 can’t come fast enough!!! ok guys in the photo in the post back and forth between the host and the guest i saved it and opened it in my photo viewer and there is a cardbord box in the left side of the photo it has a pink box i am thinkin its for a ladies hat also has a half a adress and a yellow sticky not on it i thinking those are some sort of clues i just cant figure it out some take a look and let me no what u think. I think the print out is the first half of the web chat thatJosh and mysterio was having. On finding that something was reactivated they switched chat rooms, hence 4d 5o’s last leg. thats why its a print out actually what we are looking at is the other sides evidence or survelliance when we look at the print out, but when we do the toadfish 112 we have access to view their 4d 5O chat room. so figuring out that cryptic message is just going to get us probably the site at which they chat from. Also thats who mysterio was referring to when he said they was looking in the wrong place he was referring to the men in black when they incidently reactivated the survelliance unit. If this is true i wonder what words or phrases reactivated it? I think 4D and 5O are hexidecimal, when i put it through a converter i got 19792 could this be a file on the comp where mysterio is hosting his chat room with josh? i already tried binary and just searching that but it didnt turn up any good sites. last leg could refer to the 2 which i deduced to be February. In reading the page, it mentions astonaut Cooper…which I thought may or may not have been interesting based on Cpt “Coop” Cooper. It may be COMPLETELY irrelevant, or it may not. I’m WAY late coming to the Super 8 party…today is actually the first time I’ve even looked at all this. but why would someone want a toadfish??? Avendolo gi giocato sarvpeo in un progetto totalmente nuovo SPOILER GIGANTE ma sono cos fessi da mettere tra gli screen la boss battle finale? 4D & 5O’s last leg has been solved. Looking at the October rare fish calendar, from the first week go 4 Down; then from the left go 5 Over and you come to October 21. The “last leg” of the rare fish sighting for that day began at 11:09 pm. That’s when the chat went live between Josh and Mysterio on the STIES site. Hey I have a dumb question, I havent been able to get this print out to work for me, can anyone help? i didnt even know this existed.. you guys have done some serious analysis! !